Self Portrait, 2017. Oil, gold leaf, and book cloth on canvas. 66" x 108". On June 23rd, 2004, I was eight years old, and my parents bought new sand for my sandbox. That somewhere in the world a country was at war that day was of little interest to me. But coming to terms with identity—especially multicultural identity—is an ongoing exercise in looking beyond dichotomies of “us versus them”. It is to grow into a relationship with the world at large. The Japanese folding screen, or byōbu, is an object that divides a room, but ties together artistic narratives from both East and West. Pairing traditional Japanese motifs with the European medium of oil on canvas, this screen-as-self-portrait serves as a symbol of a mixed race identity, and illustrates an interplay between one individual narrative and simultaneous global history. Its sides contrast the trajectory of my life, drawn from journals and photographs, with that of disastrous and influential scenes on the world stage. 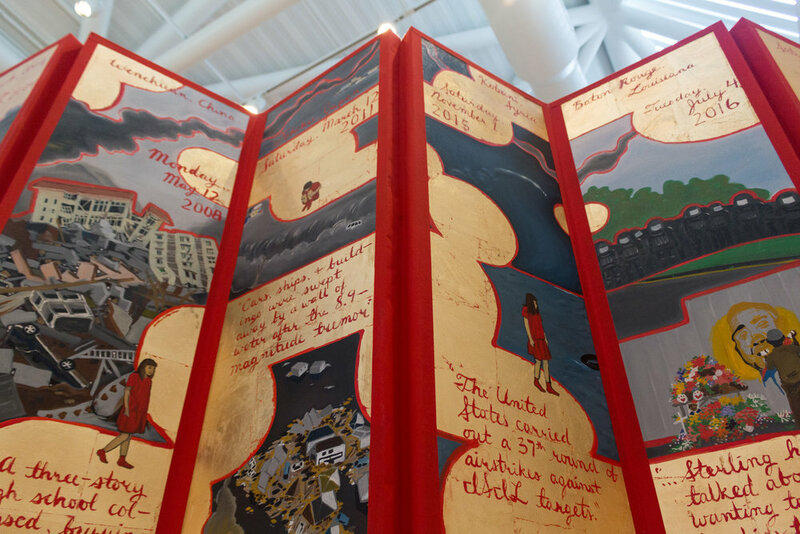 Each panel illustrates a moment in history witnessed by the artist, a character dressed in red. She travels through the development of both a multifaceted individual and global identity across the literal unfolding of time. Maybe you learned to fold origami as you grew up, a curious skill. It can transform one two-dimensional plane into almost any three-dimensional object; make cranes for world peace, even fold solar panels into space shuttles. Origami is associated with Japan, but was actually developed in the nineteenth century from European designs. This is one small way that even the art of Japan, an island that tried to exclude the rest of the world for so long, actually has multicultural roots. Not unlike origami, the Japanese folding screen, or byōbu (屏風), has history in East and West and maintains its functionality through a few simple folds. It was on screens that Japanese artists depicted the first Dutch traders to reach their island, and centuries later where French Impressionists explored Japonisme. Paired with the celebrated European medium of oil on canvas, this byōbu, called Self Portrait, incorporates such distant artistic influences as a representation of mixed-race identity, and its imagery illustrates an interplay between personal narrative and global history. As a self-portrait, the painted portion of the screen stands at my height and, when folded closed, about the width of my body. It is made up of six panels, a customary number for byōbu as well as the date of my birth, on the sixth day of the sixth month. Like traditional screens, it is constructed from a light wood frame without using metal hinges, and allows images to flow uninterrupted across the panels—like the unearthly gold leaf clouds that are also an iconic motif of byōbu. My style of painting derives from the strong lines, compositional strategies, and isometric perspective of Japanese art, particularly ukiyo-e prints, but incorporates the dimensionality and quality of light employed in Western art. The imagery uses a full spectrum of colors, but cadmium red appears as a highlight throughout the composition. Red is also an auspicious color in Asian cultures, and significant throughout my work both because of my admiration for Fauvist painting and because of its exuberant and unapologetic nature. Each panel corresponds to a journal entry, beginning in 2004 when I was eight years old and concluding close to the present. One side of the screen illustrates these entries with scenes drawn from my own photographs, while the opposite maps news images and information from world events that fell on or notably close to the date of the entries. As the autobiography unfolds, it becomes increasingly entangled in global events, and closes with my attendance at the Women’s March on Washington in January 2017, leading both the individual and universal sides of the screen to share a moment in history. The narrative reads from right to left, but it wraps around both sides of the screen in an unbroken loop that can be entered at any point. The contrast between the largely peaceful and mundane events of one life with the wars, natural disasters, and human rights abuses depicted in the news is intended to be jarring. 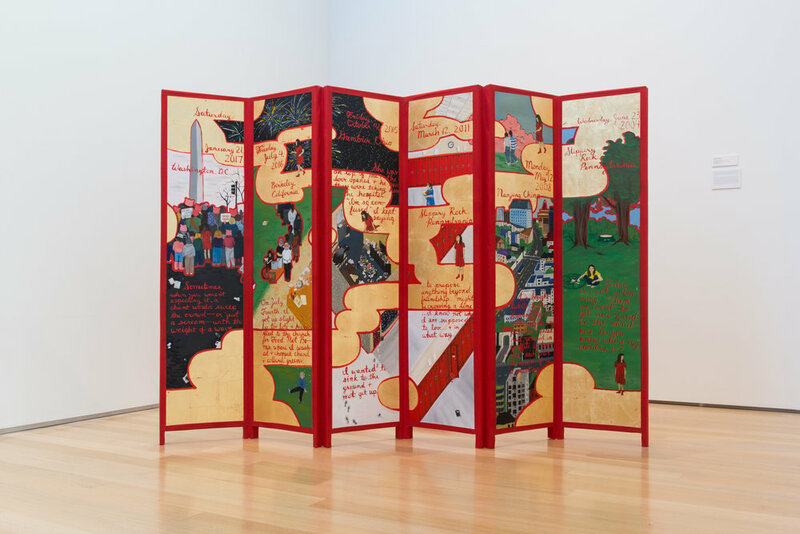 Across both sides of the screen, a figure wearing red observes the scenes, serving as a guide to the viewer as well as a representation of the artist as a grounded witness—a reminder for myself during the process of painting that I take responsibility for portraying images of injustice with heavy consideration. In another sense, I visually place myself within each scene in order to negotiate my role in the world as an artist, citizen, and human being. Mixed race individuals may sometimes feel they have no homeland. But as Ruth Ozeki—one of my favorite authors, who is also half-Japanese—once told me, it is also our power to be able to exist between worlds. It is my hope that viewers of this work will identify with aspects of the culture we share—unavoidably, the scenes that play out on the world stage—in ways that lead them to consider their own trajectory in a global context alongside my own. 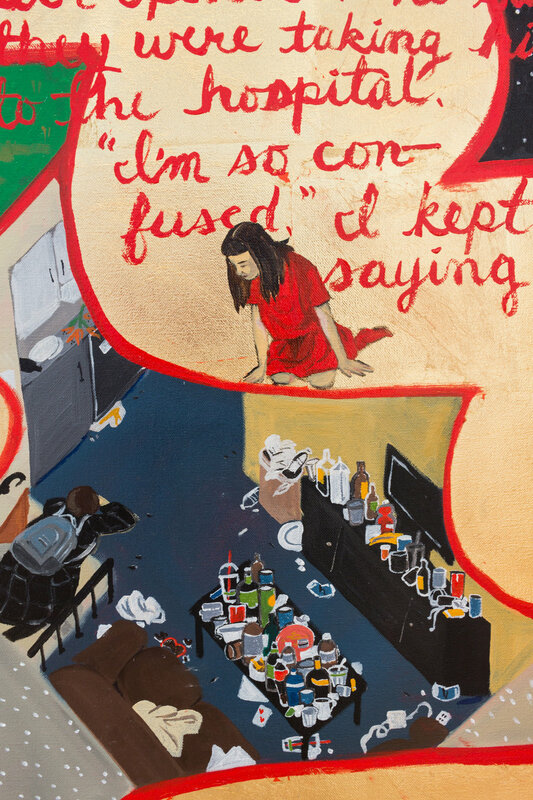 Self Portrait speaks to a few of the ways in which seemingly disparate cultures can build upon one another, and that an object that inherently divides space can also tie together narratives.